1, The model online is only for reference, you can change doll's color free of charge, but changes must be stated before producing. 2, Our bobblehead dolls can be shipped to any country in the world. 3, The producing for Smiling Face and Non-smiling Face is totally different, so please be cautious when you choose the picture for the bobble head. 1. Select the body type from our extensive gallery!! Select the options: hair, complexion, eyes or other options in the order form and upload your pictures. 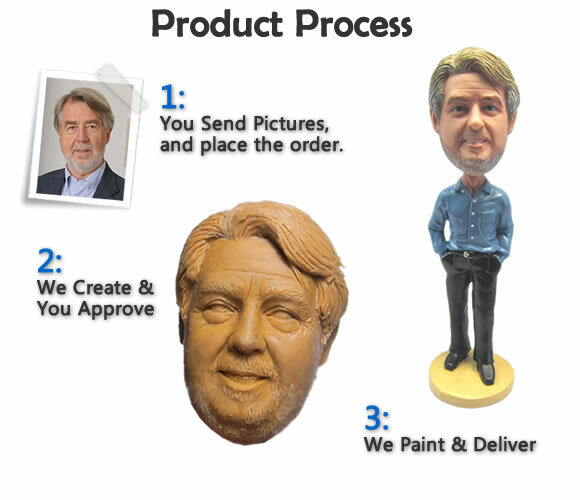 If you need to get a full customized bobbleheads made with your imagination of body, pose and head, then you need to load the appropriate pictures. Check out and you are done. 2. Proof Approval: We will send you the first proof through email approximately 4 days from the date of your order to preview the proof on our interactive online panel. Here you can also communicate directly with the artisans by posting your feedback or changes that you would like.